Congratulations to senior Sophia McGee and sophomore Alayna Cuevas as they both qualified to the Northeast Regional Cross Country Meet to be held at Boardman on Saturday, October 27th. Sophia finished in 11th place overall (19:45.52) and Alayna finished in 17th place (19:56.52) as the top 20 runners and five teams qualified for the Regional Meet. 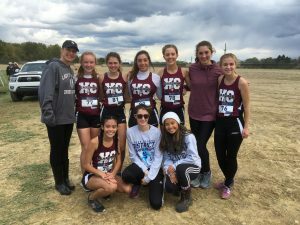 The Spartans team led by Head Coach Stacey Hunter placed 8th in the team scoring and finished the season as the runner-up in the AAC Red Tier. Come out and support our Lady Spartan cross country athletes and Mitchell Dunham from the boys team as they compete on our home course this Saturday for a chance to go to the OHSAA State Meet.